One of my favorite Christmas songs is by a guy who didn’t even believe in Jesus: John Lennon. Do you know his song “Happy Xmas (War is Over)?” Simple lyrics but it’s such a haunting song to me—singing the refrain over and over at the end. I think the song sticks with me so much because it seems like we’ll never be able to say that war is over. I actually started writing this last year right when Obama had pulled out all of the troops stationed in Iraq, but got sidetracked from posting this by the time Christmas really rolled around. Are we any closer to having a happy Christmas for people around the world than we were in 2011? Funny how someone who didn’t believe in Jesus reminds us that things aren’t right in the world. I wonder if Lennon knew about Isaiah 2:4. The near and the dear ones / the old and the young. Let’s hope it’s a good one / without any fears. The rich and the poor ones / the road is so long. For the yellow and red ones / let’s stop all the fights. Let’s hope it’s a good one / without any fear. Another year over / a new one just begun. 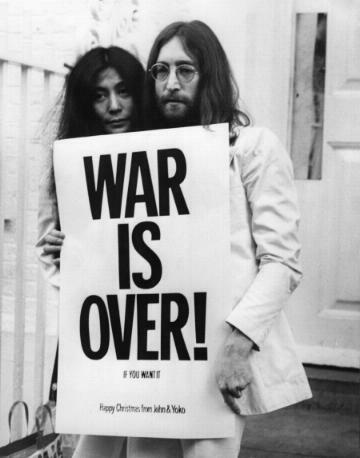 War is over if you want it / war is over now. What IF??? What if we ALL wanted it to be over? There’s a reason that verse comes before Isaiah’s line about people turning the tools of war into tools of farming. Interesting how spears and swords take things away from us, but plows and pruning hooks provide things for us. Let’s get started on having a happy Christmas together. What do you say? This entry was posted in Christmas, forgiveness, Kingdom of God, politics and tagged Christmas, forgiveness, Kingdom of God, politics. Bookmark the permalink. Brian, I love this song and what it stands for, but I really want to clarify something here. While Lennon had a habit of making highly controversial remarks and songs filled with much vitriol, he was in fact, a believer. His main frustration was with his perception that the church existed more as a money-making and growth-centric entity than it was interested in connecting people to Jesus Christ. He believed strongly that religion was intrinsic and often used Jesus’ own words to justify his thoughts. (In particular he liked to quote “The Kingdom of God is at hand” which he cited that religion should be personal rather than communal. His studies with the Maharishi and his involvement in T.M. were both (according to him) so that he could have a closer relationship with Jesus. The new book “The Lennon Letters” has many examples of Lennon quoting Jesus and is worth a read if you’d care to know more about his real thoughts. That’s so cool to find out, Jamie! I had no idea, as I’m sure is true for countless fans & critics. I’ve always thought that some of what Lennon stood for is very Jesus-y. The only thing about your comment that I DON’T LIKE is that it adds another book to my super long reading list. Ha!